I know that lots of adult collectors like to set up there 8", 9" and 12" figures in a variety of settings and dioramas. 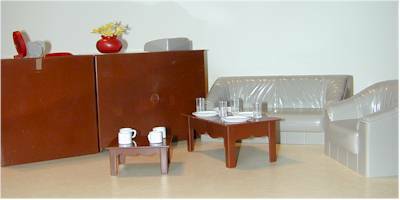 This set provides some unique furniture for these types of dioramas, and can be quite useful for doing photo shoots. 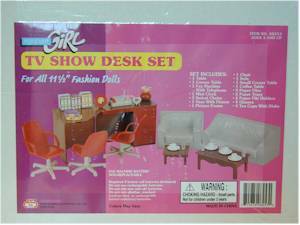 Why they would do a TV Show Desk Set is beyond me, but they have, under the Fashion Girl banner. It's currently available at J.C. Penny's online for $6.99 - the shipping will cost you more than the set. 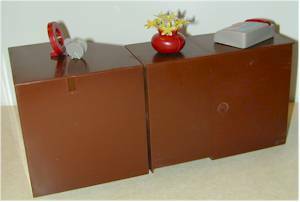 This set is made up of a two piece brown desk, brown coffee table and end table, gray couch and seat, 3 red/gray desk chairs, plates, cups and glasses for four, a picture and frame, potted plastic flowers, working digital clock, phone/fax machine that makes two sounds, and a set of cardboard items including some books, in and out boxes, and book 'holders'. The scale on this items is a bit wacky. Looking at the pictures to the left, you'll notice that the desk chairs and desk are nicely in scale with each other, while the tables, couch and gray chair are all in scale with each other. However, the desk items and the couch/tables aren't in scale! 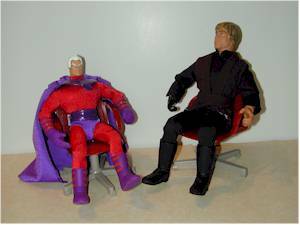 If you look at the various photos below, you'll notice that the couch/tables are very much in scale with 9" figures (pictured with various Famous Covers figures) while the desk and chairs are in scale with the 12" figures (pictured with Jedi Luke). 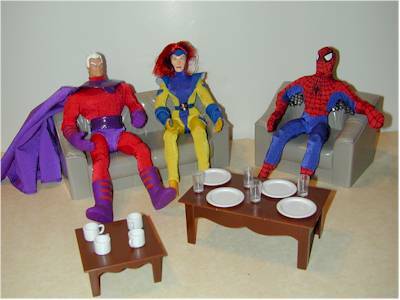 The couch/chair and tables items, including the glasses, cups and plates, are all very nice to use for 8" and 9" figures, such as Megos, Famous Covers, Exclusive Premiere or Playmates Star Trek. The detail is also good, and the colors are neutral so no additional painting is really necessary. I still prefer the cloth couches you can buy at many discount stores for 12" dolls, but this set isn't bad, and finding good coffee and end tables is tough. The desk chairs are also very good, and a tough item to find, even for Barbie. They are very useful for 'office' style dioramas, and three of them is very generous. The working clock, fax machine and picture frame all will come in handy for 'a day at work' dioramas. I don't mind the complete screw up on the scale too much - I have other couches I could use for 12" figures if necessary, and a good desk for 12" figures is hard to find. But the quality of the desk is not the same as the other pieces. While it has some very cool drawers that work, there are a number of holes in the top that don't clearly work with the accessories provided, and it appears that there is a slot underneath for another interior drawer which is missing. This detracts from the overall appearance of the desk. 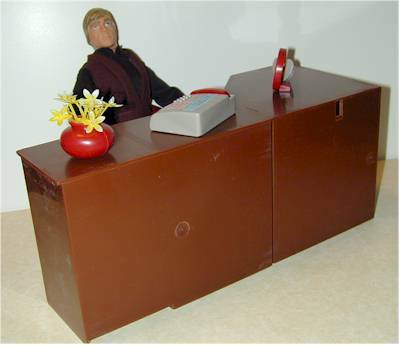 If you're looking for some furniture to help you with work place diorama's, then you'll find this one quite useful. It's also an exceptional bargain at only $6.99 - but I paid over $7 in shipping. If you can find it at a Penny's store, or perhaps a Penny's clearance outlet, you'd be one step ahead. And if you needed a set to pose your Rosie O'Donnell doll, this is just the ticket. It's unfortunate that the entire set is not scaled the same, but it's still an exceptional value. The direct link to this item at the Penny's site is atrocious - instead, go to www.jcpenny.com and search for TV Show Desk.